This is a famous (and rightly so) southern Italian dish, popularized in red sauce joints across the north-east of America. I’ve eaten it at Franco & Luigi’s in south Philadelphia and at La Villa in Park Slope, Brooklyn, amongst other places, and enjoyed the contrast of the garlicky sausage, the heat of the pepperoncino and the smooth, starchiness of the pasta. The recipe is usually made with broccoli rabe (rapini) rather than kale but I think kale works really well, especially if you leave the stalks on. It’s also dead easy to make and comes together in under half an hour which is perfect given my recent schedule. My wife and I share the cooking duties in our house, but of late, she’s been doing the bulk of the cooking because I’ve been getting home too late from work and its been annoying me that I’ve not been able to cook. However, she is the one that normally makes this dish, as with many Italian dishes (I tend to do better with traditional British recipes – a heritage issue, I guess), but because I managed to get home in reasonable time tonight, I decided to do the honors and let her relax with the cat. For a first-timer, without a recipe and only having watched it being prepared before, this one worked out rather well and, gratifyingly, received my wife’s seal of approval. The key seems to be the garlic and white wine, and giving the pasta time to cook into the sauce. Heat saute pan to medium high and add a splash of olive oil just before adding sausage. Brown sausage on both sides, approx. 4 mins per side, and remove to a plate. Be sure to leave fat in pan! Reduce heat to medium and add onions to pan and allow to soften in the fat. Just as they begin to brown add garlic and hot pepper. When garlic takes on a bit of color hit pan with the wine. Add pasta to boiling, well-salted water. Bring back to a boil, cover and set timer for 8 minutes. Turn heat back up to medium-high and add kale. Toss mixture together and after two minutes, reduce heat to medium again before adding tomatoes. When tomatoes look like they’re collapsing into the sauce, add the sausage, and turn to medium low. Check pasta is a little less cooked than al dente. Kill heat under pasta and turn heat to high under saucepan. Using a spider or a slotted spoon, add pasta to saucepan DO NOT POUR PASTA WATER AWAY. Mix pasta and sauce together and add enough pasta water to lubricate the bottom of the pan. Cook for another minute or so on high, or until pasta is al dente and sauce looks silky. Kill fire and add cheese. Spoon pasta into bowls and finish with a glug of really good olive oil and an extra sprinkle of cheese. Orrechiette with sausage and broccoli rabe is one of my favorite dishes, and I make it all the time during the winter months. 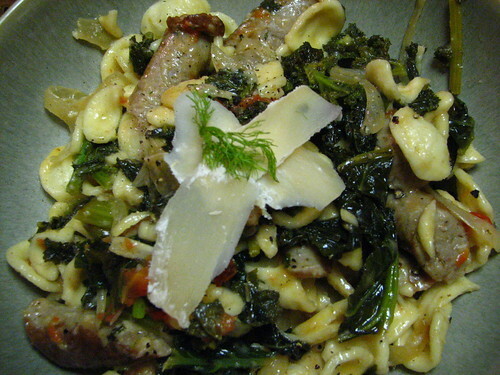 Last night I made a different version though: whole wheat pasta with broccoli rabe and chicken sausage. It was really good (my husband really liked it). Obviously it’s quite a versatile dish. Yours looks great! great recipe. i just googled ‘sausage and kale’ as i sat in the market, just to get an idea, and this one in the first page of results. a quick review confirmed that this is exactly what i wanted, and the approach was just what i would do. i did add a bit of chicken stock, but it would have been fine with just pasta water.